This is my slightly adapted version using ingredients that I had in my house and it came out so good! It’s super creamy and packed with my favorite springtime vegetables – asparagus, mushrooms and peas. Serve as a side with baked chicken breasts or with a salad for a meatless Monday meal. Give this easy, quick, all in one pan recipe that your whole family will love a try! In a large skillet over medium heat melt half the ghee. Saute the asparagus and mushrooms for about 5 minutes. Add the rest of the ghee, onions, garlic and thyme and cook for another few minutes. Add the cauliflower, peas and vegetable broth, stirring and cook until broth is has evaporated. Add the milk, ground flax or flaxmeal and nutritional yeast. Heat and stir until creamy. The main inspiration for these cookies is my son, whom I like to refer to as a “selective” eater. It’s always been somewhat of a challenge to get him to eat a healthy breakfast, and now, more than ever, as he becomes a teenager, a good breakfast with protein and healthy fats to power him through the day as well as stabilize those mood swings is essential!! These cookies fit the bill! They’re packed with amazing ingredients, chewy, rich, sweet and all around delicious! Gluten-free, dairy-free and KID APPROVED! In a large bowl, stir together the almond butter, honey and vanilla until smooth. Then add in the oatmeal, flaxseed, chia, hemp, cinnamon, baking soda, and salt. Stir mixture very well. Finally stir in the raisins. 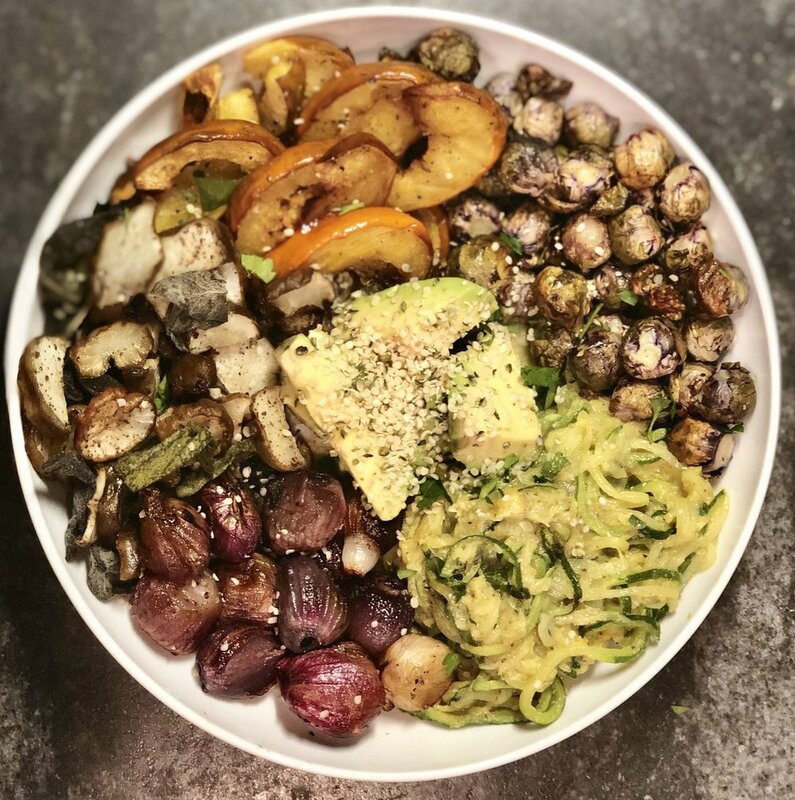 I wanted to use these baby red onions and baby purple Brussels sprouts that I got at the market so I simply roasted them with other vegetables I had in the house and made this delicious Buddha bowl. The baby onions totally gave this dish such a yummy flavor! So easy and so good! When the vegetables are ready, just put them in a bowl, add some avocado and hemp seeds (for added protein). As always feel free to substitute with any other veggies of your choice. Toss, drizzle, or spray all vegetables with oil and spread on baking sheets. Brussels, onions, sunchokes and squash all take around 35-45 min. Add the zucchini when there is about 12-15 minutes left of cooking time. Toss all veggies halfway during cooking time. Remove any veggies that are lightly browned and continue to roast the rest until done checking every few minutes to avoid burning. When zucchini noodles are done, put them in a separate bowl and mix with nutritional yeast. Assemble the bowl with the vegetables. Top with avocado and sprinkle with hemp seeds. Healthy turkey meatballs so simple and quick to make, served over zucchini noodles, and you’ve got yourself a winning weeknight dinner. And if the rest of your family prefers pasta over zoodles (as they do in my house), serve their meatballs over Banza pasta and everyone’s happy! In a large bowl combine the ground turkey and seasoning and mix well. Take 1 tbsp. at a time of the turkey mixture and roll it into a ball using your hands. Place on baking sheet and bake for 16-18 minutes. Heat up sauce in a saucepan and place meatballs in the sauce when they come out of the oven. Place zucchini noodles in a Pyrex baking dish, drizzle or spray with oil, season with salt and pepper and bake for about 10 minutes until noodles are softened. Remove from oven. Plate zoodles (or pasta if you’re using) and spoon meatballs on top, sprinkle with fresh parsley or basil and enjoy! 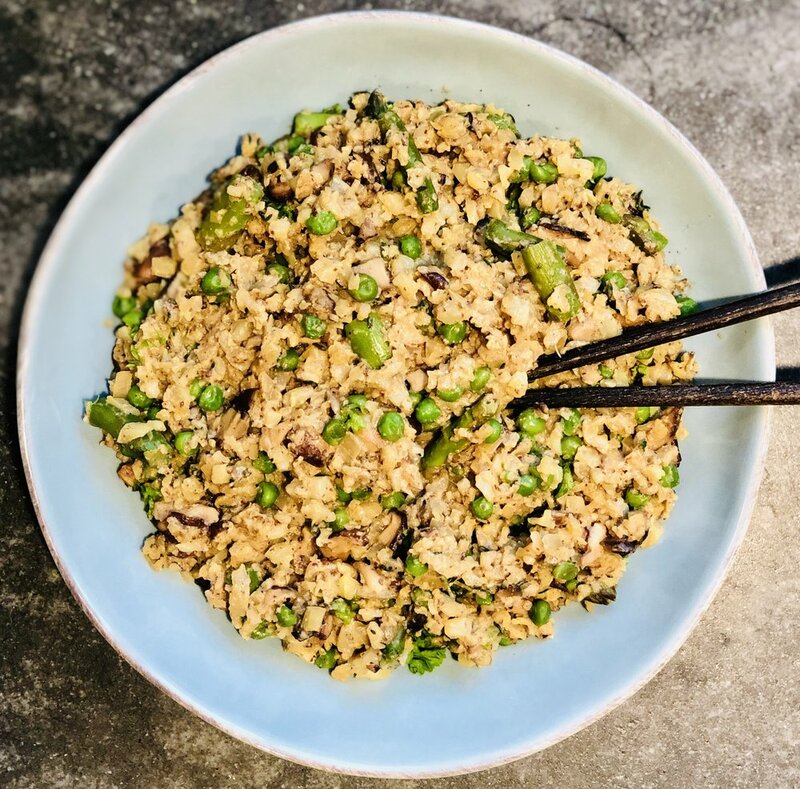 This nutrient-dense, easy-to-prepare dish is packed with protein, good for you fats and is super satisfying. The light and fluffy cauliflower puree is a great replacement for mashed potatoes and goes great with the salmon and spinach. A delicious meal to add into your midweek dinner rotation. Preheat oven to 375 degrees. Toss, drizzle or spray cauliflower and garlic cloves with olive oil and place on baking sheet. Roast for about 25-30 minutes until starting to brown. Remove from oven and set aside to cool. Turn oven up to 425 degrees. Wash salmon fillets and pat dry with paper towel. Drizzle salmon with just enough oil to coat with a pastry brush, sprinkle generously with everything but the bagel seasoning. In a blender, whip roasted cauliflower, garlic, ½ the vegetable broth, 1 tbsp. olive oil, salt and pepper until smooth and creamy. Add more broth to make creamier if needed. Finally, heat a little olive oil in a skillet over medium-low heat. Add spinach, season with salt and pepper and sauté until wilted. Plate the mashed cauliflower and spinach and top with salmon. This bowl is a delicious, healthy and filling way to enjoy taco night. 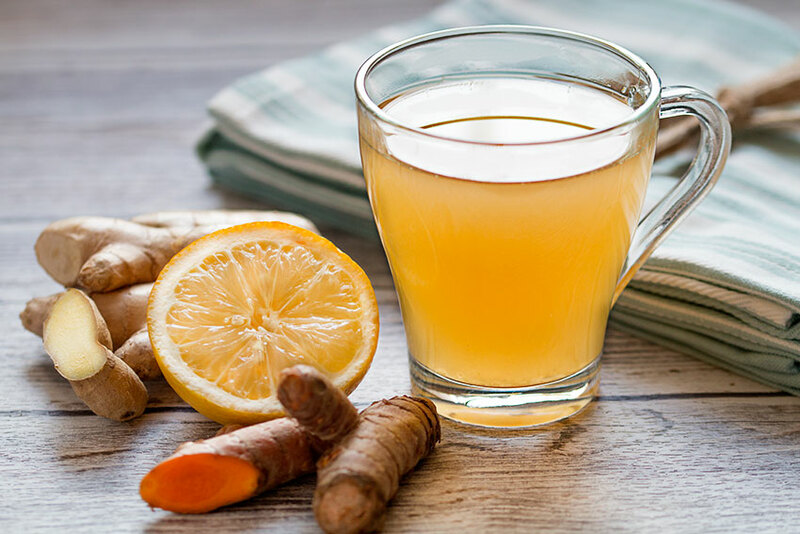 It’s perfect for those avoiding gluten, dairy or following a whole foods or Paleo diet. Coat the flesh side of squash with oil, season with salt and pepper and place cut side down on baking sheet. Roast for 40-45 minutes or until soft. Remove from oven. Toss cauliflower with avocado oil, season with salt and pepper and roast for about 15 minutes. Then toss and drizzle zucchini noodles with oil, season salt and pepper and add to baking sheet with cauliflower and cook both for 10 – 15 min. more or until desired amount of browning and tenderness. Remove both from oven. Place ground turkey meat in a large skillet over medium heat. Cook meat, breaking up with a wooden spoon until cooked through, about 10 minutes. Add chili powder, garlic powder, onion powder, crushed red pepper flakes, oregano, paprika, ground cumin and salt. When meat is evenly spiced add marinara sauce. Cook until everything is well combined. Mash avocado, add lime juice and season with salt and pepper. Assemble the bowl by filling the squash with meat, spinach and cauliflower. Top with smashed avocado. Plate the zucchini noodles and salsa. Enjoy! This delicious comfort food is extremely flavorful while being light and healthy. It takes under 30 minutes to make so it’s perfect for a weeknight meal and is an easy clean up because everything is made using the same pan! Heat 2 tbs. olive oil and 2 tbs. ghee over medium heat in a large pan/skillet (I used cast iron). Add in onion and garlic and sauté until softened and onions are starting to become translucent, about 3-5 min. Add the shrimp to pan, season with 1 tsp. salt and red pepper flakes. Cook until shrimp turn pink, about 3 minutes. Add lemon juice and half the parsley, stir until well combined, cook for another minute, remove from pan and set aside. Add the remaining olive oil and ghee to the pan. Add cauliflower, 1 tsp. salt and freshly ground pepper. Any onion and garlic pieces left in the pan will add flavor to the cauliflower as well. Cook, stirring regularly for about 6-8 minutes until cauliflower is soft but not mushy. Remove from pan and set aside. Finally, add spinach to pan, toss in the remaining oil and ghee until wilted. Remove from pan. 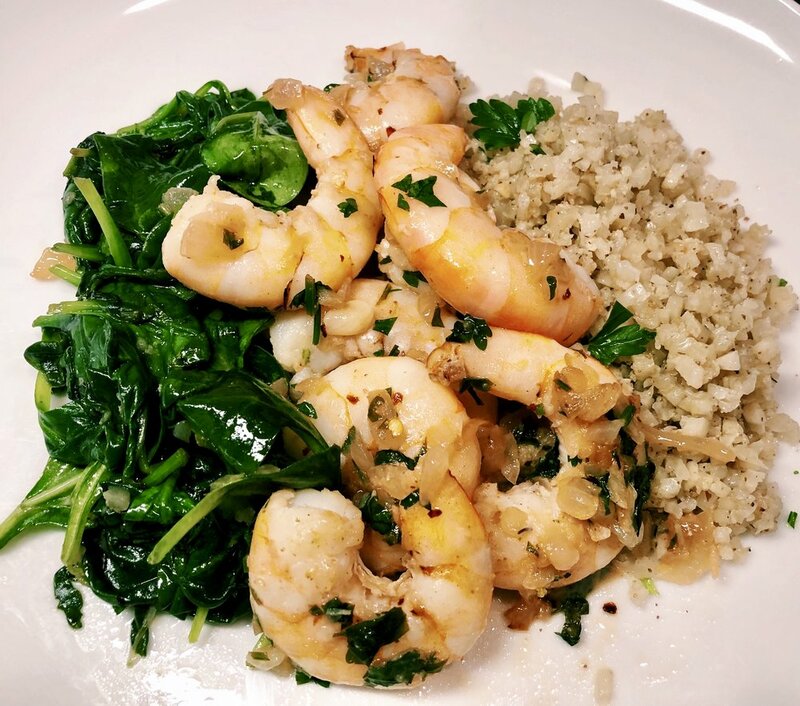 Assemble by plating cauliflower rice, shrimp and spinach. Drizzle with excess scampi sauce, and sprinkle the rest of the freshly chopped parsley on top, serve and enjoy! You can also add everything back to the pan once the spinach is wilted and serve the dish mixed together. (I didn’t because I have picky eaters who prefer theirs separated). My goal with these cookies was to balance out the aftermath of all the sugar-filled, holiday parties and celebrations, with a treat made with non-processed, healthy ingredients to help ease kids back into their routine. The verdict = pretty amazing…they were gobbled up in no time! These cookies are so decadent you’d never guess they were flourless and made without processed sugar. Make these chewy, fudgy cookies with your kids. They will love them and you’ll feel good about their eating them! In a large bowl, combine peanut butter, coconut oil and coconut sugar. Add the egg and then the cocoa powder. Stir until well combined. The mixture may be very thick so feel free to use your hands. If needed you can slowly add a tbsp. of water or milk at a time to make the mixture more manageable. Add baking soda, vanilla, salt and chocolate chips. Mixture should be a thick dough consistency. Roll about 2 tablespoons of dough into balls, place on baking sheet and press down with a fork. Bake for 12 minutes. Remove from oven and let cool for 10-15 minutes before removing from pan. Cookies can be stored in the refrigerator in a closed container for about a week or frozen for months. Go bun-less with this healthy and delicious substitution for a regular cheeseburger and fries. I topped each burger with smashed avocado and salsa but feel free to amp it up by adding other toppings such as grated cheese, jalapenos or pureed black beans. Freshly prepared salsa or you can make your own by combining: chopped seeded tomatoes, red onion, cilantro, jalapeno, lime and a pinch of salt. Preheat oven to 375 degrees. Slice sweet potato into round slices about ¼ inch thick. Spray, drizzle or toss with a little oil. Place on baking sheet avoiding overlapping slices and bake for 30+ minutes or until edges are browned. 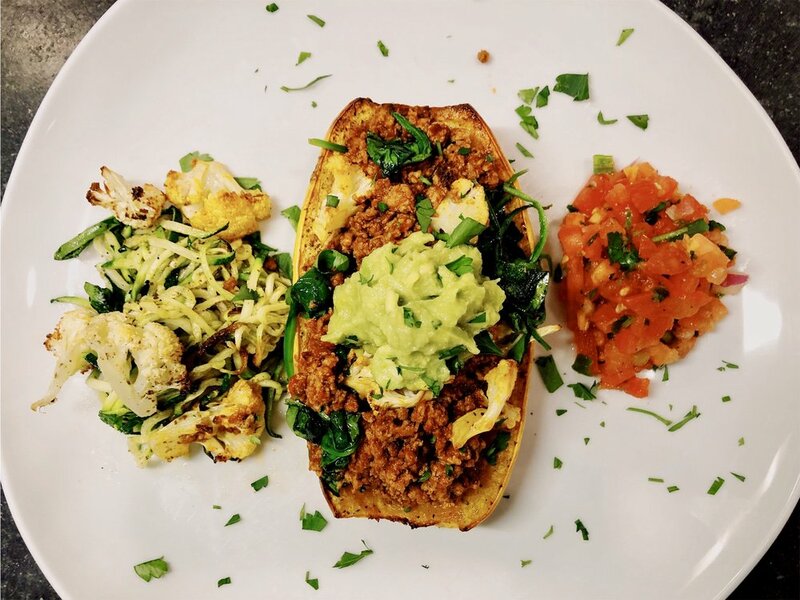 In a large bowl combine the ground chicken, onion, garlic, cumin, paprika, almond flour, egg, juice and zest of 1 lime, cilantro and jalapeno, salt and pepper. Blend everything together using your hands so that the seasoning is evenly distributed throughout the chicken meat. Heat 1-2 tbsp. coconut oil and sprinkle sea salt in cast iron skillet over medium-high heat. Add the burgers and cook until the bottom is brown and crispy, about 4 minutes. Flip burgers and cook for another 4 minutes. Remove skillet from stove and place skillet in oven with the sweet potatoes for 10 minutes to make sure they are entirely cooked through and then remove from oven. While burgers are in the oven massage kale in a bowl with 1 tbsp. extra virgin olive oil, juice from ½ lemon, salt and pepper. In a small bowl, smash avocado, juice from 1 lime and season with salt and pepper. When burgers and potatoes are done remove both from oven. To serve, put some of the kale on plate. Place sliced sweet potatoes on top of the kale. Place burger on top of sweet potatoes and top with smashed avocado and salsa. 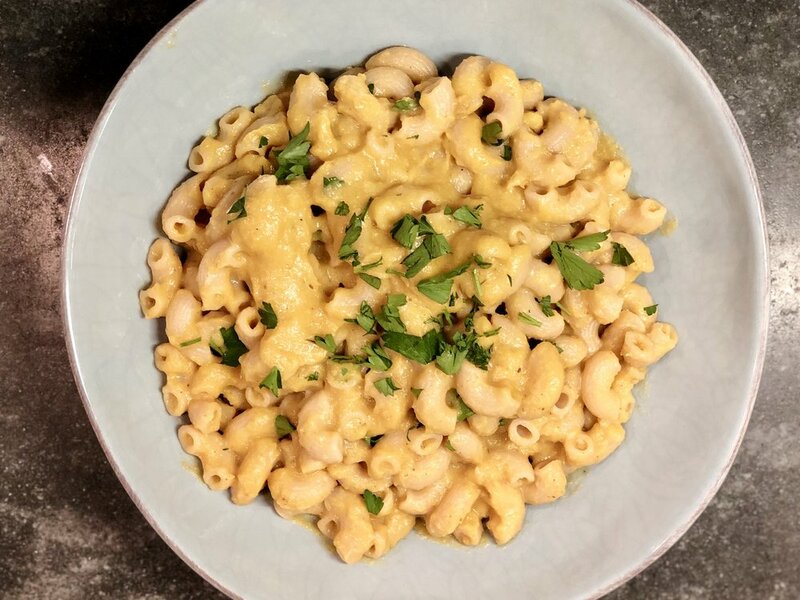 Whether it’s dairy, gluten or another ingredient that you can’t tolerate, this not-real-cheese-but-still-delicious-creamy-yellow-sauce-over-macaroni recipe will work for you. It’s a nutrient dense, flavorful alternative to the classic comfort food that will leave you richly satisfied. In a medium saucepan melt coconut oil or ghee over medium heat. Add onions and cook, stirring until the onions start to soften, about 7-8 min. Add garlic, stir and cook for another minute until garlic is fragrant. Add squash, cauliflower and broth and bring to a steady simmer. Cover pan and cook until vegetables are very soft, about 20 minutes. Once veggies are very tender either use an immersion blender or transfer to blender. Add remaining ingredients (milk, lemon juice, mustard, nutritional yeast or parmesean cheese, salt and pepper) and blend until very smooth. Taste and adjust seasoning, pour on pasta, mix well, sprinkle with chopped basil or parsley and enjoy! A frittata is one of the easiest things to make - it’s like a fancy omelette, except there’s no flipping involved. My favorite time to make it is when I’m in the mood for a light quick weeknight dinner. 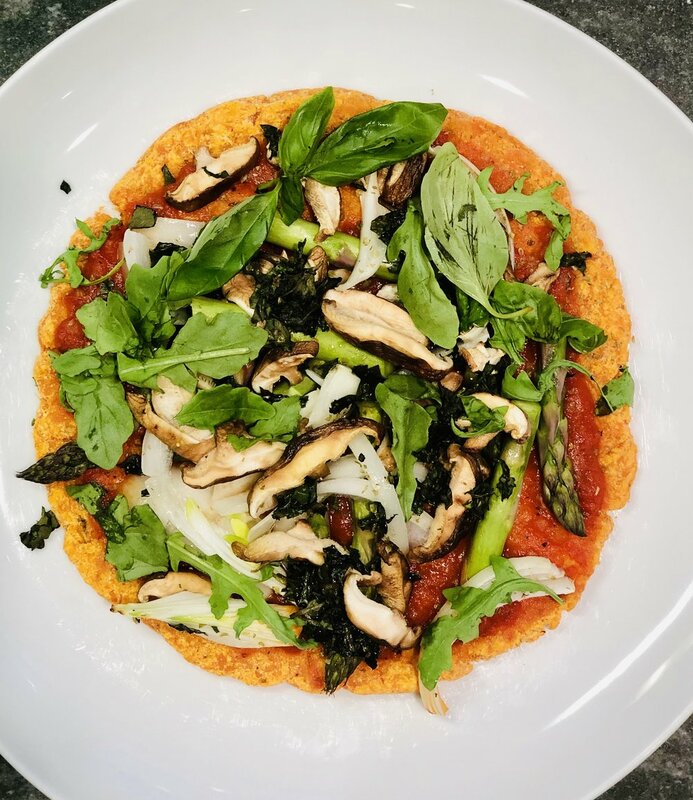 Not only is it super nutritious but you can put just about anything in the pan and it will taste great! Heat a cast iron skillet over medium heat. Add 1 tbsp. olive oil or ghee to the pan to heat. Add onions and a pinch of salt and sauté until starting to brown about 6-8 minutes. About half way through cooking the onions, add the mushrooms and a pinch of salt and freshly ground pepper. Sauté for about 5 minutes until soft. Finally add spinach and stir until wilted. Turn up the heat and let any excess liquid evaporate from the pan, then remove from heat. Beat the eggs and milk in a large bowl (you can do this while the veggies are cooking). Place the skillet back on the medium heat. Add the remaining tbsp. of oil or ghee and once hot, pour egg mixture into pan. Tilt the pan to make sure the eggs settle evenly over all the vegetables. Swirl the pan gently, tilting it slightly with one hand while lifting up the edges of the frittata with the spatula in your other hand, to let the eggs run underneath during the first few minutes of cooking. Once you see the eggs at the edges of the pan beginning to set put the pan in the oven and bake until the eggs are set, about 10 minutes. For a browned, crispy top, run under broiler for 1-2 min and remove from oven. Let cool in the pan for at least 5 minutes, then slice into wedges and serve. Leftovers can be stored in an airtight container in the refrigerator for about 4-5 days. 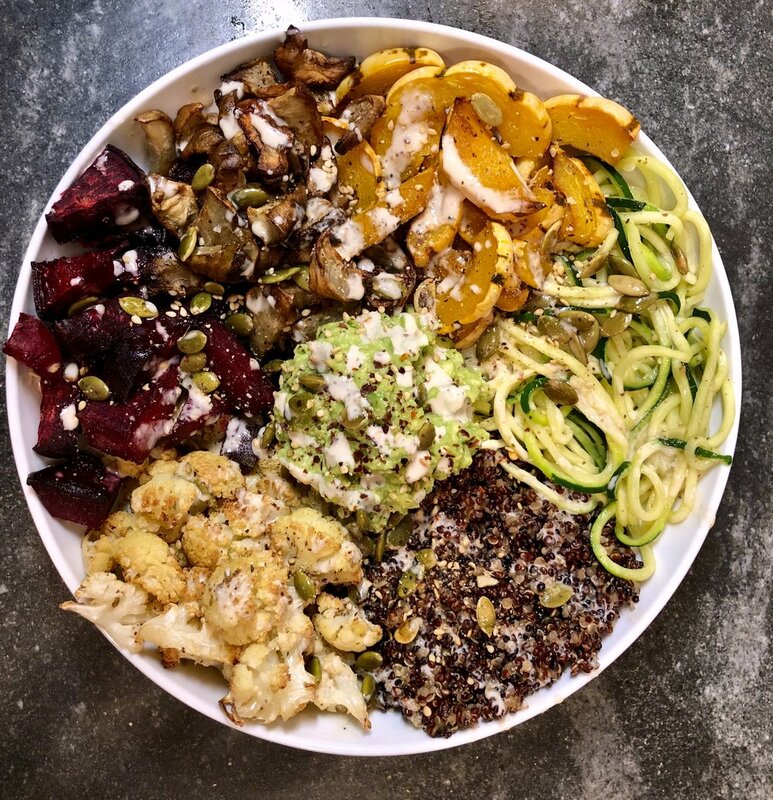 This bowl has it all and is perfect for a meatless Monday meal – fluffy quinoa, crunchy seeds, healthy fats and lots of delicious roasted veggies! It’s super easy to throw together because all the veggies take approximately the same amount of time to cook so they can be roasted on the same pan. When they’re ready just put in a bowl with quinoa, avocado, pumpkin seeds and drizzle with tahini dressing. As always feel free to substitute with any other veggies of your choice but this is a winning combo! Toss cauliflower, beets, squash and sunchokes with oil/ghee and spread on baking sheet. Roast for 30 minutes, tossing halfway during cooking time. Remove any veggies that are lightly browned and continue to roast the rest until done checking every few minutes to avoid burning. Toss zucchini noodles with oil/ghee, spread on baking sheet and cook for about 10 minutes, toss and another 5-10 minutes until just starting to brown. Add the tahini, salt, pepper and apple cider vinegar to the bowl. Whisk until thoroughly blended. Assemble the bowl with the veggies and quinoa. Top with mashed avocado and sprinkle with red pepper flakes. Sprinkle with pumpkin and sesame seeds. Finally, drizzle with tahini dressing. Season with additional salt and pepper.